The Lord God then took the man and settled him in the Garden of Eden to cultivate and care for it. The Saint Francis Garden began in 2002 as a hope that one day we could use part of our property to teach hands–on stewardship of the land and ecology. 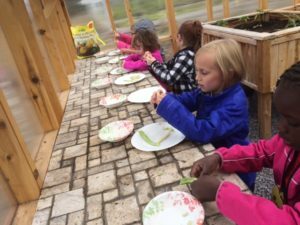 The first garden plots were mapped in 2010 and with the help of Mrs. Julie Roberts, Mrs. Linda Rode, students and parents our school garden has grown to include the greenhouse, sprinkler system and ten raised, covered beds. Many hours of service, donations of bedding materials, plumbing and building supplies, and grant funds have been put into the garden. In the spring of 2016, the school was given a second green house and the Knights of Columbus graciously laid a new foundation, supplying all the materials and labor. As a result, Saint Francis students have an incredible outdoor space that functions for both science lab and food production. 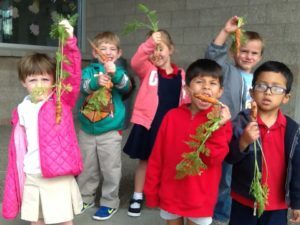 The School Garden makes consistent donations to local shelters throughout growing season. 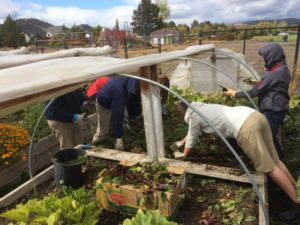 Students work with their teachers to manage the garden for the school. They practice sustainable living skills and learn the food cycle while caring for seedling, worms, and the soil. 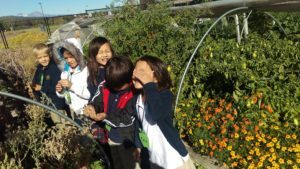 All students can participate in preserving food waste nutrients in the compost, starting seedlings, and helping to keep the beds weed free. Our students know the feel of healthy soil, the parts of a seed, but also how their choices affect the environment. Composting, waste-free lunches and using the recycling bins are important practices for the stewardship of our planet. Care and respect for God’s gifts to us are at the center of our teaching. What good is it, my brothers, if someone says he has faith but does not have works? Can that faith save him? If a brother or sister has nothing to wear and has no food for the day, and one of you says to them, “Go in peace, keep warm, and eat well,” but you do not give them the necessities of the body, what good is it? So also faith, of itself, if it does not have works, is dead. Stewardship: the responsible overseeing and protection of something considered worth caring for and preserving. 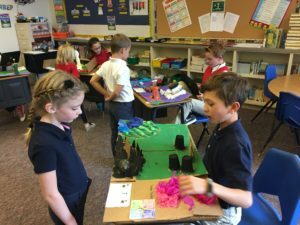 Saint Francis students are encouraged to notice those things worth caring for: the younger child, the elderly, the sick, the friend, the parent, the lonely, the hungry, the poor, the animals, the plants and the earth. The encouragement here comes in the form of opportunities for action. 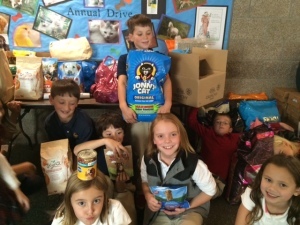 Each classroom has chosen a charity, the student council brings worthy causes to the student body, and the school has traditional annual drives.